We are so excited about this conference in Bath! Come and see the TRC HQ therapy centre, hear some incredible speakers, choose some workshops to up skill your work with vulnerable children. Meet practitioners from all over the UK who are pioneering work to help children who have experienced early life trauma to recover! Hear about the latest research in neuroscience and it’s application to daily life! We can’t wait to tell you about this! Hold the date…you are going to want to come! As we start 2018, we have been reflecting on all that took place for the TRC last year - here are 17 things that we got up to in 2017! It was a big and busy year, with lots of achievements, and we look forward to continuing to expand and help families in their recovery from trauma. 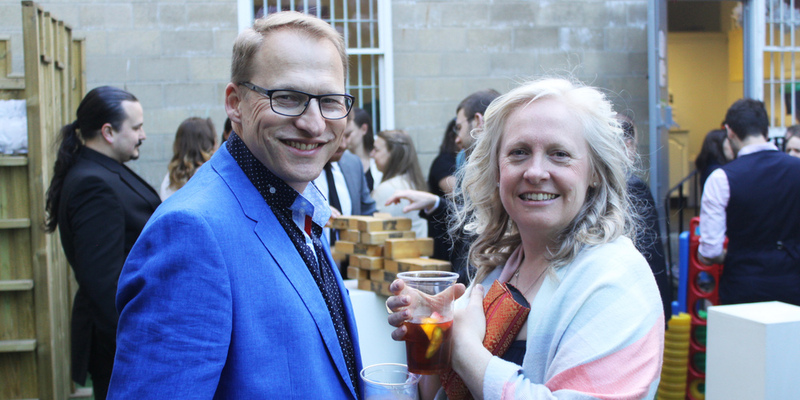 The Trauma Recovery Centre celebrated its 4th birthday with a Summer Jazz Evening on Friday 5th June at its UK headquarters on the Lower Bristol Road, Bath. The TRC first became a registered charity on 3rd May 2011 and since then has provided support to 100’s of families with over7,200 therapy sessions provided free to children and young people alongside over 1,620 parenting group sessions for families from the local area and further afield. We celebrated by hosting a Summer Jazz Evening, including live music from local band Chaser Jazz Trio, canapes donated by local businesses, Pimms in the garden with garden games donated by Jolly Jumpers, a raffle and a silent auction. The highlight of the evening was a short presentation on the work of the TRC followed by the first ever TRC Awards ceremony. Although all the families that come to the TRC show courage, we felt that it would be good to choose two each year to specifically honour for overcoming significant adversity. Two families were chosen who had been helped by the TRC for some time and were presented with a TRC award for ‘Courageous Parenting’ by Ben Howlett MP and the TRC’s director Betsy de Thierry. All profits from the Summer Jazz Evening will benefit the ongoing work and expansion of the TRC. We have given £650,000 worth of therapy sessions FOR FREE to children and young people in Bath and Bristol. Families have been able to come and engage in free parenting courses led by highly skilled professionals whilst their children have free art, music or play therapy. We’ve written reports, attended meetings and been available by email all week. Our amazing staff work many, many hours attending meetings and writing endless reports, outside of their sessions without being paid. We are so very grateful for their generosity and kindness. We’ve seen amazing ending evaluations as the children and young people leave with their original objectives met. Now, the waiting list is approx 80 and we have needed to think through what to do. We have many other cities where such a service doesn’t yet exist and people asking us to start a similar holistic centres all over the UK. So we have decided to ask parents and clients over 18 years to pay something towards their therapy. We know that for many this is tough and we are not asking for a lot- just a donation- and it is being sorted out individually according to peoples ability to contribute. So for example a homeless client will not pay anything, our syrian refugees won’t pay anything- as they have nothing! Others may have to suspend extra curriculum activities for a season while we work with their child to help them recover. So our new season begins. The cost of running the therapy centre- even if everyone contributes say £25 a session will be approx £120,000 per year. But this will enable us to take on more staff to expand and see more of the desperate families who email each week have the service they need. Just to summarise. We have given over 12,500 free therapy sessions so far and over £650,000 worth of therapy! We don’t offer 12 weeks of talking therapy because we believe that the impact of the trauma resides in the unconscious and subconious which takes longer to fully process and therefore we use creative therapies to enable full, long term recovery rather than short term management. We are asking parents and adults to think about what they can contribute or instead fundraise to help us help more families.